If you have a budding artist and are looking for a great activity to do outdoors, check out this amazing acrylic paint stand DIY posted by Meri Cherry. Of course, it could also be used inside, but using it outside adds an extra element of fun because you can incorporate water play into the activity. While Meri Cherry didn’t actually make this acrylic paint stand, she does post directions and tips to help you make your own. 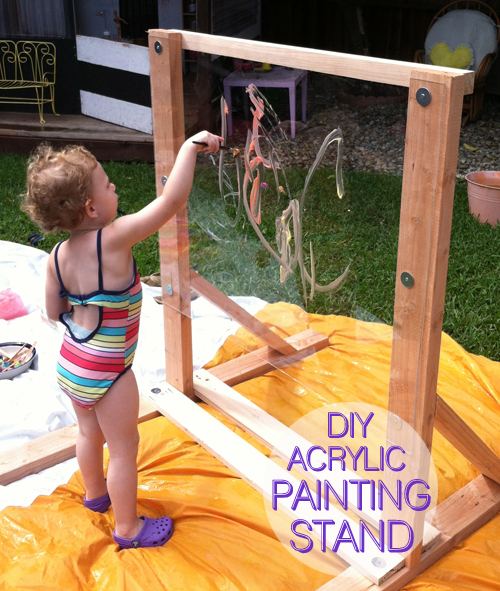 Discover how to make your own DIY Acrylic Painting Stand. I’m so sorry, but I’ve looked EVERYWHERE and can’t find the instructions or materials list for the acrylic painting stand! Help! There aren’t really instructions but she offers some tips if you want to make it yourself and notes she got everything at Home Depot (and they actually made it for her) so you could probably take a picture to your local store and see if they can help with materials. See http://www.mericherry.com/2013/07/18/diy-acrylic-painting-stand/ for more.